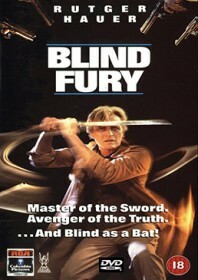 Hauer is Nick Parker, a Vietnam vet blinded during the war and taken in by a tribe of swordsmen who teach him their blade skills despite his disability. Twenty years later, Nick tries to hook up with an old army friend in Miami only to walk into a ready-made showdown. His buddy owes money to mob leaders and his son Billy (Call) has been headhunted as compensation. Those blind Samurai skills come in handy against a barrage of adversaries, including a brief cameo from Sho Kosugi as a tacked-on Japanese assassin. To be fair, the action isn’t at all bad. Hauer does well in the Zatoichi-inspired role with sharp awareness and a good nature, while also getting adequately physical during the fight sequences.